The easing of spending caps could stave off more furloughs, at least for now. Agencies likely won’t have to force employees to take unpaid leave in 2014, but accomplishing their missions could still prove difficult. In December 2013, Congress finally came together to pass a bipartisan budget compromise, which includes a temporary rollback of spending caps put in place by the 2011 Budget Control Act—also known as sequestration. Lawmakers received praise for their efforts, which put a two-year hiatus on political bickering and gamesmanship that led to drags on the economy, credit rating downgrades and a two-week government shutdown. The agreement, however, reduces the wrath of sequestration by only $63 billion over the next two years. The caps originally required the federal government to cut spending by $218 billion in 2014 and 2015. That means 71 percent of the cuts will still go into effect, which could help agencies avoid more furloughs. But they’ll probably have to continue to freeze most hiring, reduce training and restrict travel. President Obama acknowledged this reality in a press briefing. Looking forward, it should not be forgotten sequestration is a 10-year program. Absent further congressional action, the full slate of cuts will resume in 2016 and continue through 2021. Why Aren’t More Feds Teleworking? About half of federal employees have been told by their supervisors that they are, indeed, eligible to telework, yet most aren’t doing it. While infrequent telework can help agencies achieve certain goals, such as emergency preparedness, it’s generally understood that agencies will not realize the full savings from telework in areas such as real estate and energy unless more federal employees telework more frequently. Forty-seven percent of feds were notified in September 2012 of their eligibility to telework, yet only 21 percent of those eligible did so that month, according to the Office of Personnel Management’s latest telework status report. In fiscal 2012, 30 percent of those eligible said they teleworked at least infrequently. While the 2010 Telework Enhancement Act set firm requirements for counting eligible employees and drawing up telework agreements, it did little in terms of measuring results, according to Kate Lister, president of Global Workplace Analytics and the Telework Research Network. “It’s easier to say employees are eligible than it is to make it possible for them to do it,” Lister says. 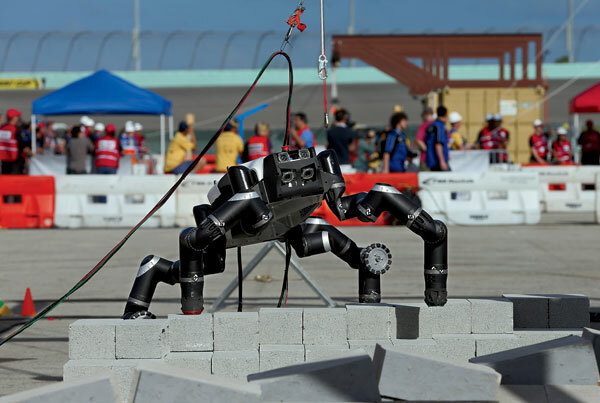 RoboSimian, a robot developed by NASA’s Jet Propulsion Laboratory, demonstrates how it can traverse the rocky terrain created by an earthquake or other natural disaster at the Defense Advanced Research Projects Agency’s Robotics Challenge trials in Homestead, Fla., in December 2013. The challenge pitted 17 robots against each other in a series of eight competitions focused on helping disaster survivors. RoboSimian is among eight finalists that will compete for a $2 million prize. The study “From Data to Decisions: Lessons From Early Analytics Programs” by the Partnership for Public Service assesses the impact of five programs that digest myriad indicators to predict everything from famine to health care needs. Payoff High-risk patients who were seeing assigned doctors were 10 percent less likely to be hospitalized or dieLessons From Early Analytics Programs” by the Partnership for Public Service assesses the impact of five programs that digest myriad indicators to predict everything from famine to health care needs.